We build heavy-duty 6x6 machines for you—and the work that goes with it. For tough terrain and working off-road, there's nothing like the additional traction from a 6x6 being driven by the torquey and efficient Rotax 450 engine. 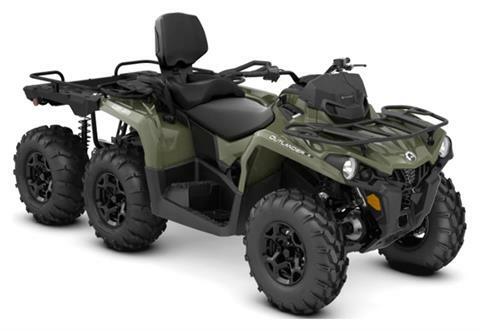 CONTINUE THE LEGEND: Tackle rough tasks and navigate off-road with a 38 hp single-cylinder, liquid-cooled Rotax 450 engine, proven to offer an unmatched balance of power and performance while remaining both reliable and efficient. Renowned for flexible reliability in harsh conditions and easy maintenance, Rotax engines have seen every corner of the world—and that's not a boast. MAXIMIZE YOUR CAPABILITY: Like everything else on the Outlander 6x6, the MAX seat is engineered for a reason, with ergonomic multiposition handgrips and raised floorboards to ensure more comfort on long rides—or flip the passenger seat down in seconds and gain even more cargo capacity. GRABS AND GOES: The Outlander’s Continuously Variable Transmission (CVT) means that no shifting is required. It’s calibrated to always deliver optimal torque output in all uses and conditions. You can also count on engine braking to automatically reduce your speed when going downhill. 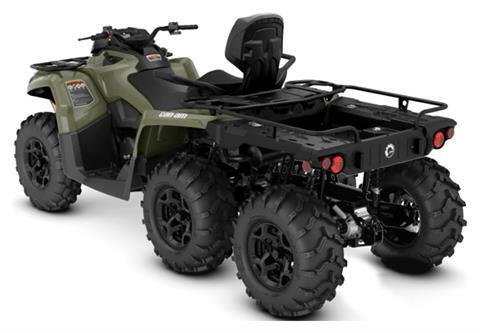 The extra low L-gear makes it easier to maneuver the ATV in demanding conditions—for example, when pulling your trailer or in deep mud. CONTROL AT YOUR FINGERTIPS: Feel off-road terrain like never before with Tri-Mode Dynamic Power Steering (DPS), which gives easy steering assistance and adapts its response to the vehicle's speed. At lower speeds, assistance is increased to reduce your steering effort, while at higher speeds it's reduced to return maximum feel to the rider. Choose between three modes to match your preferences. STAY IN THE GROOVE: Visco-Lok† QE has all the features and benefits of the standard quick-engagement Visco-Lok† differential, but with an even quicker engagement point for heavy work use. This differential, unlike some competitors' differentials, does not have a speed limiter. WORKS RIGHT OUT OF THE BOX: An industry-leading 1,650 lb (750 kg) towing capacity, front and rear racks with cargo extenders, and LinQ attachments points will make the Outlander 6x6 your preferred companion for work and play. REAR RECEIVER HITCH: E-coat finish. Does not affect ground clearance. Trailer ball not included. This hitch offers 1,300 lb (590 kg) of towing capacity. Compliant with european T3 regulations.